Hiring makes sense if you want to try a few lessons before committing to buying a guitar, or if you are in Brussels without a guitar. 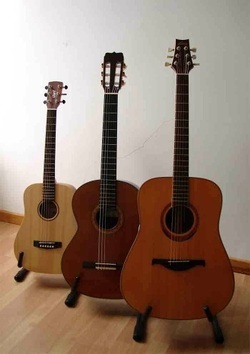 There are two steel-string acoustic guitars, a nylon-string classical and a small-scale childrens' guitar available for hire. Contact info@guitarlessons.be to find out about current availability. Each guitar comes with a padded zip bag, so that you can carry it to lessons, and a stand. All guitars - 15 euro per week. Deposit - 100 euro.